Just off the coast of Mexico, within sight of crowded Cancun but a 20 minute ferry ride across the blue Caribbean, lies Isla Mujeres, a tiny coral island that is one of Mexico's true treasures. Isla is no tourist haven. Just off the coast of Mexico, within sight of crowded Cancun but a 20 minute ferry ride across the blue Caribbean, lies Isla Mujeres, a tiny coral island that is one of Mexico's true treasures. 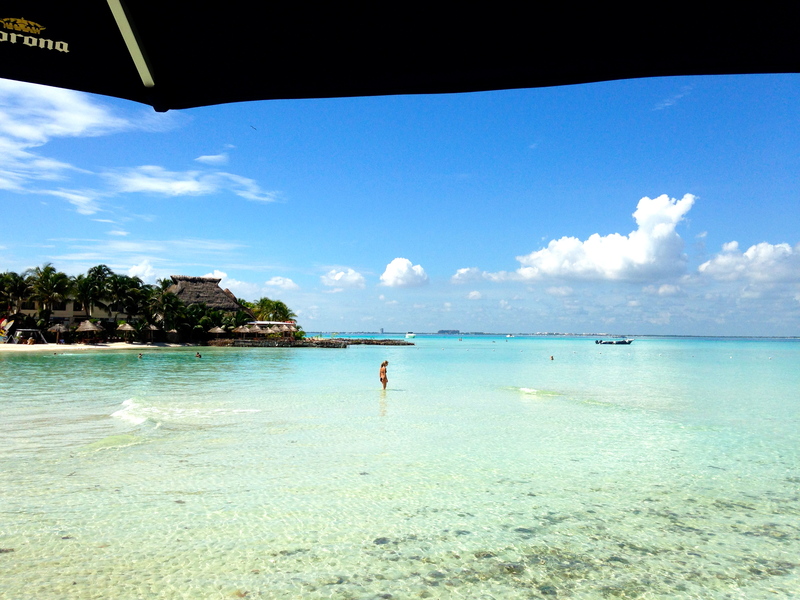 Unlike its mainland neighbor Cancun, Isla is no tourist haven. It doesn't boast monstrous resort hotels and riotous nightlife. All it has is clear blue water, good food and some of the most beautiful beaches in the world. Isla Mujeres has been discovered by Italians, French, British, and Australians who travel a long way to get there, but its easy proximity for Americans makes it a gorgeous site for a long weekend, relaxed vacation, or destination wedding. Nothing. Isla is well-suited for people who want to sit on the beach, enjoy a cerveza, margarita, or rum punch, take a dip in the ocean or a pool, and relax. If you're drawn to busy-ness, you've come to the wrong place. But if you want a great view of the white Cancun skyline in the distance -- or of the vast blue sweep of the Caribbean -- while you read that book you've been meaning to finish, take that nap you always promise yourself, or nosh water-side on fresh-made guacamole, ceviche, or shrimp cocktail, then sit yourself right down. Your hotel may offer prime beachfront -- the Avalon, at the northern tip of the island has the most beautiful beaches, as witnessed by the boats dropping off customers for a swim -- or you can do day-trips to high-end hotels like Casa de las Sueños or Villa Rolandi and beach clubs like Zama. You may need to pay a chair rental for day use, but you may also be able to simply plop and pay: buy a sufficient level of food and drink, and your place in paradise is free. Check -- and negotiate. The island also has plenty of scuba outfitters, snorkeling spots, fishing boats and opportunities for outdoor adventure. Garrafon Park features zip-lining, including two legs high over the blue Caribbean, and some limited snorkeling. Dolphin Discovery offers dolphin encounters for young children, and swimming with dolphins for older children and adults. The flatness of the island and dearth of traffic makes it perfect for discovery by bicycle, while the cliffs of the south end of the island offer a nice walk. Restaurants on the island specialize in seafood (as they should), in Mexican food, and in Italian food -- because of the visiting Italians. The gelato shop to visitor ratio is pretty amazing. And while there are few places you can get a great martini or a fine single-malt, you can get a good to great rum punch, tequila sunrise or piña colada all over. You're on an island in the Mexican Caribbean -- eat and drink locally and you'll have a great experience. Plan to carry cash -- not every restaurant takes credit cards, and those that do often impose a five per cent service charge for it. Casa Rolandi may be the best restaurant on the island -- and one of those few places to get a sophisticated drink. You can't go wrong with anything on the menu -- the Swiss ownership of the hotel where the restaurant is housed guarantees quality and attention to detail. I'm fond of their grilled seafood -- the salmon is heavenly -- and we always get the lobster ravioli. The pasta is colored and flavored with squid ink, a great sea taste to contrast the buttery lobster and the cream sauce. For a starter, try ceviche, shrimp cocktail or one of their carpaccios, and for dessert the helado (ice cream) con Kahlua for a simple but rich end to your meal. Like many ocean-front restaurants on the island, they will set up a table near the water for a romantic beach dinner -- I proposed to my fiancée on the beach here, and every detail of that evening, from start to finish, was perfection. Our first evening on the island we always eat at L'Argentina on the island's main drag, Hidalgo Street. Try their ceviche for a starter, and one of their grilled meats or fajitas for a main. Although the online reviews are mixed, they do beef and seafood well. Drinks are a bit hit or miss depending on the bartender. On one visit, we were offered shots of a smooth-sipping local mezcal; on another, a year later, no one seemed to know what we were talking about -- and while my rum punch was sunny perfection, my fiancee's margarita was badly mixed. Also on Hidalgo Street, you'll find Casa Rolandi's more-casual little sister Rolandi's. A great stop for pizza or pasta, and like its namesake a little more elegant than its surroundings. Try the linguine in clam sauce, a light white wine wonder, or the tortiglioni in Rolandi Sauce, rich and creamy. For Italian food this good, you may want to choose from the small but thoughtful winelist; the Argentinian malbec was a great complement to my pasta. If you've missed out on dessert at Casa Rolandi, you can also get the coconut ice cream with Kahlua here. For a true tropical experience, you'll enjoy the Sunset Grill on the north beach. If you come during the day, sit in one of their oceanside chairs and enjoy a snack like their tangy and tasty fresh guacamole. For dinner, they do seafood well -- especially fried food. Consider sharing a combination platter, and don't miss their coconut shrimp. This is a great place for tropical drinks, and a wonderful place to watch the sunset--Isla offers dramatic sunsets behind towering clouds -- far better than anything on cable. For a basic room -- and the island's best location -- try Avalon, on a coral island reachable by a wooden bridge. When we were there recently it was undergoing a complete redo as an all-inclusive (set to premiere in 2014), but it already offers good value. The rooms overlook either the dark blue Caribbean or the clear blue bay, the breakfast is tasty and good value, with fresh fruit, red or green chilequiles, omelets, breads and cereals, and there is no better place to spend a day at the beach. It's also kid-friendly, as the water is shallow and access to the hotel limited. They have a pool, offer activities like volleyball, karaoke and bocce, and have an on-site scuba shop. If it's not essential that you be on the beach, try Bahia Chac Chi, a small and relatively inexpensive boutique hotel in midtown a few steps from the ferry dock. Take advantage of the fact that this is one of the island's "high rises" (five stories), and get a bayfront room for gorgeous views of the water, the sunset, and the boats. The higher you are, the better your views--and the less noise you get from the street below. Their beautiful little pool out of the sunshine makes a nice retreat for a sun-burned beach bum, and they offer wi-fi in every room, still rare on the island. TripAdvisor voters have named Villa Rolandi, on the island's western shore, a Traveler's Choice for the past two years, and the mostly-suite accommodations are gorgeous and meticulously maintained. All enjoy a view of the water and distant Cancun. Guests are shuttled back and forth from the mainland on Rolandi's private yacht, and enjoy some of the most beautiful grounds you'll ever see. You could spend your whole trip by one of the pools, surrounded by flowers and palm trees, or head down to Rolandi's strip of private beach. A favorite with destination weddings -- not only do you have the great restaurant and spa services onsite, but the Swiss ownership makes sure everything is done right. Casa de Los Sueños is a high-end villa in the southwest quadrant of the island. You can rent it in toto and pretend you are a rock star, or reserve one of the nine suites (or the Presidential suite) ala carte. The rooms and suites are gorgeous, all have an elevated ocean view, and the facilities are beautiful. The grounds stretch down to the beach, and feature a pool, two restaurants with bars (one is closed in October and November, the island's least busy season), and spa services. You can get a massage on the dock, with the waves lapping beneath you. Also a wedding venue worth exploring -- a small party could rent the entire villa and have the ultimate rock star wedding, without those pesky paparazzi. Many airlines service Cancun -- check for direct flights from your city. Service may vary by season and day of the week. Before you go, consider booking a shuttle to your ferry (or private yacht pickup) to avoid the crush of taxidrivers and touts in the Cancun airport. We have had great experiences with BestDay -- inexpensive but reliable transfer service. Book your transit to the Port of Juarez, where you'll catch the short ferry ride to Isla. You can buy a round trip, and the ferry goes every half hour. On the island, you may want to rent a golf cart if you plan to travel to Avalon, to Villa Rolandi, or to the south side of the island. While there are several places to rent a golf cart, the price everywhere will be about fifty dollars a day. You can also rent a scooter, or if you don't want to rent transport, take a taxi. Because the island is tiny, the north end of the island is easily walkable -- just bring an umbrella for the occasional thunderstorm.